In recent years, Latvia's economic performance has been impressive. Its growth rate is among the highest in Europe and the country and its neighbours are often referred to as the Baltic Tigers. Soon after its independence in 1991, Latvia started to reform its pension system. It was the first CEE country to fundamentally restructure its first pillar. Today, Latvia runs a three-pillar pension system. The first pillar is a PAYG, notional defined contribution (NDC) system, the second is a funded mandatory pillar and the third pillar consists of private voluntary occupational and individual pension arrangements. By introducing an NDC system combined with a mandatory pillar, Latvia arguably made the most radical and far-reaching pension system reforms in the region, alongside Poland. The demographic situation in Latvia is mixed. While the population will shrink from 2.3 million to 1.7 million between now and 2050 – one of the fastest population decreases in the EU – the population is not ageing as quickly as elsewhere. The Latvian dependency ratio will indeed worsen from 23.2% today to 44.1% in 2050, but this is a considerably better outlook than the projected EU average of 52% Nevertheless, Latvia will feel the blow of an ageing population, albeit to a smaller extent. Public pension expenditure in Latvia is projected to decrease. While it currently stands at 6.8% of GDP, it will be 5.6% in 2050. The current EU-25 average is 10.6% of GDP and will increase to 12.8%. Latvia's second pillar pension assets currently amount to EUR 183 million, and to EUR 74 million in the third pillar. The former is expected to grow by at least 46%, the growth rate of the latter will be at least 20%. Reform of the first pillar took place in 1996 and was needed because low retirement ages, widespread early retirement, social security contribution evasion and demographic change made the old system unsustainable. The new NDC system established a strong link between contributions and benefits. NDC systems transfer the logic of funded pensions to public pensions by giving participants a hypothetical or virtual account, which contains all contributions made throughout working life. These notional individual accounts are accumulated at a given rate of return. At the time of retirement, benefits are calculated by dividing the amount accumulated in the notional account by cohort life expectancy. Latvia's first pillar covers pensioners from both the old and new systems. Participation in the NDC arrangements is mandatory for all employed and self-employed people over the age of 15; it is voluntary for those who do not work. To receive pension benefits, participants must have contributed to the system for at least 10 years upon reaching the statutory minimum retirement. The statutory minimum retirement age is gradually being increased and will reach 62 for both men and women in 2008. Currently, it stands at 62 for men and 61 for women (61.5 from July 2007 onwards). Retirees are allowed to continue working while they are receiving a full pension. Early retirement (up to two years prior to the established retirement age) is possible under specific conditions. However, early retirement possibilities will be eliminated from 2008 onwards. Since 2002, pensions have been indexed to changes in the consumer price index and to increases in average wages. Indexation differs depending on pension levels, which favours low pensions. Total contributions to the social security system amount to 33%. Employers pay 24% of employees' gross salaries, while employees contribute 9%. The share of pensions in social security contributions is 20%. This means that employees pay 7.5% of their salary for pensions, employers 12.5%. In 2007, 16% are allocated to the PAYG system and 4% to the funded mandatory system. Since 1997, benefits paid under the state pension scheme have been subject to income tax. However, old age pensions that were already being paid out before January 1996 are not subject to taxation. The mandatory second pillar started operating in 2001. The scheme operates on a defined contribution basis. Participation in the scheme is mandatory for new labour entrants and employees aged under 30 at the time of introduction. Joining was optional for those aged between 30 and 40; these people could choose between staying in the NDC PAYG system only and switching a portion of their contributions to the funded part. People older than 50 were not allowed to join. In late 2006, the number of people who decided to join state-funded pensions reached 900,000. In 2007, the contribution rate for the mandatory scheme has risen to 4% (at the same time, contributions to the public pillar have fallen); it will increase to 8% in 2008, to 9% in 2009 and finally to 10% by 2010. At this point, the first two pillars will receive an equal share of contributions. During the first 18 months of operation, only the State Treasury was allowed to manage second pillar assets. Rules have since changed, and private asset managers can now also do so. The state has increasingly withdrawn from managing pension assets, as the State Treasury will cease managing mandatory pension plans and distribute the assets under management to private managers. There is no maximum limit for international investments, as long as pension funds invest in securities listed on stock exchanges in the Baltics, other EU member countries or the European Free Trade Area. However, the law stipulates a 70% currency matching rule. There is also a 10% limit for each non-matching currency (since 2005, the euro has been exempted from investment restrictions on foreign currencies). Investments in real estate, loans, and self-investment are not permitted. Contrary to many other CEE countries running mandatory pension systems, there is no requirement for pension funds to guarantee a certain minimum return. On the contrary, doing so is explicitly forbidden. Overall asset allocation in Latvia is fairly conservative despite the possibility of choosing a plan according to risk preference. In late 2006, 55% of assets were invested in debt securities, 26% in time deposits, 14% in investment funds and 5% in equities. Active pension funds do often not exploit the 30% equity limits foreseen by Latvian investment regulations. Out of the 10 active funds on the market, only one really has a 30% equity share, while four have an equity exposure between 20% and 30%, three hold equities between 10% and 20%, and two have less than 10% equity in their portfolio. 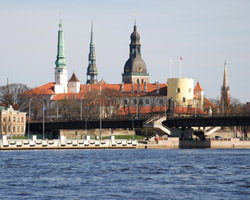 The second pillar is considered to be a part of the state pension system in Latvia. For this reason, lump-sum payments are not allowed. When reaching retirement age, participants have to choose between using their accumulated capital to purchase an annuity from an insurance company or use the "refunding" option. This means that investors move their capital to the NDC pension scheme and receive a payout based on a slightly modified NDC pension formula. If the participant decides to take out a contract with an insurance company, the State Social Insurance Agency (SSIA) signs the contract and transfers the accrued capital. Detailed provisions on the payout phase have not yet been defined, as pension benefits will start to be paid out only in 2014. Contributions are income tax deductible. Pension benefits are taxed at the ordinary income tax rate beyond the limit of LVL 1,200 (EUR 1,730) per year. The voluntary private pillar in Latvia has been operating since 1998. Pension plans in the third pillar can by be concluded directly between participants and providers, or with the involvement of the employer. However, occupational plans are far from being popular among Latvian employers. Only 5% of Latvian companies, mainly large ones, offer their employees voluntary occupational arrangements. Voluntary pension schemes are operated by private pension funds, which are non-profit joint stock companies. Under Latvian law, they are obliged to appoint management companies and custodians for their pensions plans. Pension plan assets can be managed by credit institutions, life insurance companies, investment firms and asset management companies. Both DC and DB plans can be offered. At present, six private pension funds are operating on the market. Five of these are open and one is closed, and a total of 15 different pension plans are offered. Members can join a pension scheme directly or via their employer, who can set up a closed pension fund, possibly in cooperation with other employers, or conclude a collective membership contract with an open or closed fund. Voluntary pensions offer tax advantages for both employers and employees. Contributions from employers and employees of up to 10% of the employees' annual income are also tax-deductible. Investment income is taxed, while benefits are tax-exempt up to a certain limit. Private voluntary pensions have not gained a strong foothold in Latvia. There are only about 90,000 members enrolled in voluntary plans, and assets under management amounted to EUR 74 million in 2006. The low participation rate is the result of relatively low income levels and insufficient marketing efforts. At the moment, it seems that the voluntary pension pillar is mainly used by middle-to-high income households. Benefits can be paid as a lump sum, phased withdrawals or life annuities. Investment rules for private pension funds are similar to those for mandatory funds, but are more flexible. For example, investment in real estate is permitted (with a limit of 15%), the currency matching rule is only 30% and limits for some asset classes are higher. As is the case of mandatory pension funds, their private counterparts are not allowed to guarantee a rate of return. Latvia has managed to build a sustainable pension system over the last decade with impressive growth in second pillar funds. Acceptance of voluntary pension savings in the third pillar is still underdeveloped, but this may change as income levels rise. There are also indications that public policy will promote the third pillar by improving tax policy, enhancing the monitoring and supervision of voluntary pensions, setting up financial education programmes and supporting information campaigns about all parts of the retirement system. Further issues under consideration include relaxing investment regulations in the mandatory system, establishing a reserve fund, making changes to pension indexation and introducing minimum guarantees for interest rates in the mandatory pillar.